I also took a picture with the 1930s blouse I made last year. I'm liking the shorts a lot, even if it shows a lot of white pastey leg. Oh man, I couldn't tan even if I wanted to. And believe me, I don't want to! I've learned to embrace the curse of the redhead. We don't tan, we freckle. And I'd rather have freckles than a gross cancer shade of brown. Yuck. I like your shorts, they're very cute! I also adore those picture frames with no pictures - how adorable! All you lack is a Dixie Cup sailor's hat to complete the picture. 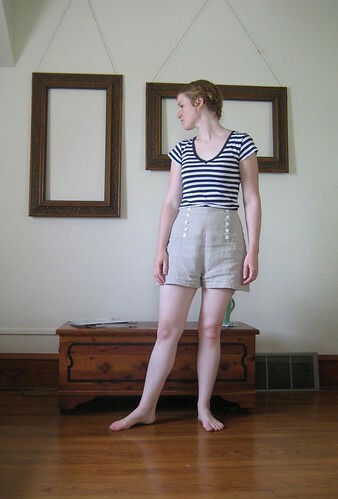 Those shorts are adorable and I really like that '30's top! I know Ive seen them already but they definitely look good. Cheers to navy stuff! Cute and I love them! Now I'm inspired to make my own vintage-styled clothing, too. They are adorable! I love how they look with your blouse also. And don't feel bad posing for pics - it's great to see clothing on actual people. :) The shorts look awesome! They make me like shorts again, even though I haven't worn any for nearly ten years (I have the pastey white leg thing going too). So cute, Anna! And I also have to add that I like the way you guys ended up putting those frames up empty. It looks really neat, not sure if you're planning to put anything in them or not, but I like they way they are now! They are such pretty frames! Those are lovely, Anna! Exactly as I pictured them when you first told me about them. Wear them all the time! Love them with the blouse! !